Why did the chicken cross the shuk? TO AVOID KAPAROT!! Yesterday, I had the unique opportunity to attend a ceremony and partake of the ceremony at the shuk that is part of the tradition to rid us of our sins during the 10 days of repentance. 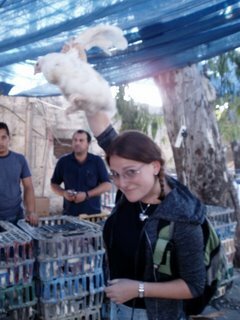 During this ceremony, one takes a live chicken, swings it over one’s head while saying a series of formulas and prayers. At the end, the chicken is then slaugthered and in this case, given as food to the poor. This was my first time taking part and even witnessing the ancient tradition, and i have to say it was quite amazing. It was wonderful to be able to take part in a tradition that my ancestors had done for so many years, but it was also amazing to have a more physical act of ridding myself of sin than tashlich. I can’t say that it is an experience that I would repeat, as there are definite animal cruelty issues, although it did look painless, but I am glad that I went. This is all a part of my plan to have as many unique and interesting experiences as possible during my time in the holy land. And so, I start the year, sin free… well, at least symbolically! You are doubly blessed ..it left no souvenirs oun you as you swung it..unlike other relatives that have been hit…Yasher Koach! !